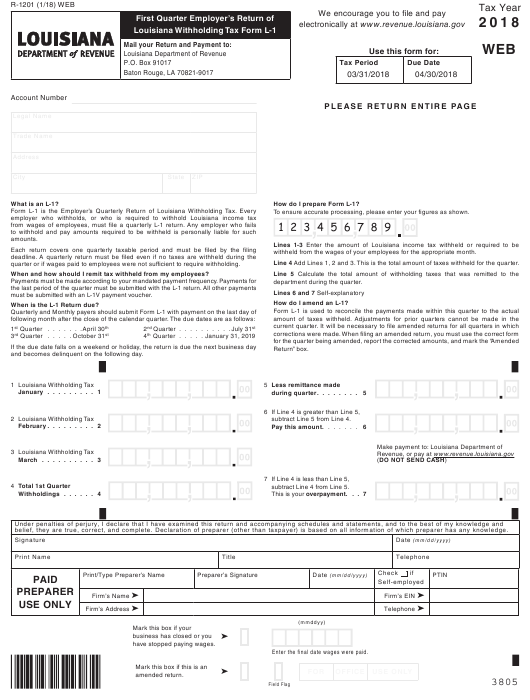 Form R-1201 or the "First Quarter Employer's Return Of Louisiana Withholding Tax Form L-1" is a form issued by the Louisiana Department of Revenue. The form was last revised in January 1, 2018 and is available for digital filing. Download an up-to-date fillable Form R-1201 in PDF-format down below or look it up on the Louisiana Department of Revenue Forms website. How do I prepare Form L-1? To ensure accurate processing, please enter your figures as shown. withheld from the wages of your employees for the appropriate month. Line 4 Add Lines 1, 2 and 3. This is the total amount of taxes withheld for the quarter. quarter or if wages paid to employees were not sufficient to require withholding. When and how should I remit tax withheld from my employees? must be submitted with an L-1V payment voucher. How do I amend an L-1? When is the L-1 Return due? and becomes delinquent on the following day. subtract Line 5 from Line 4.
subtract Line 4 from Line 5. Enter the final date wages were paid.